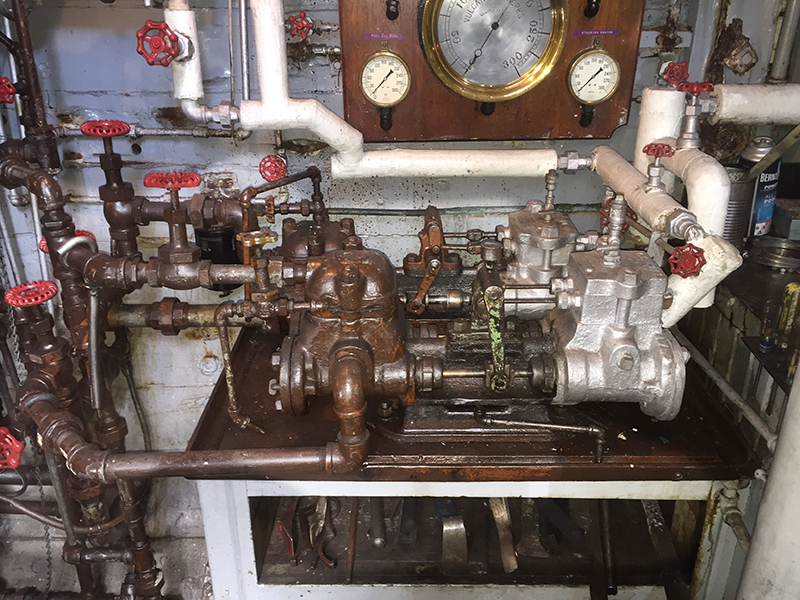 Many of the Master’s systems are run by steam, some requiring continuous steam pressure and others on an on demand basis. 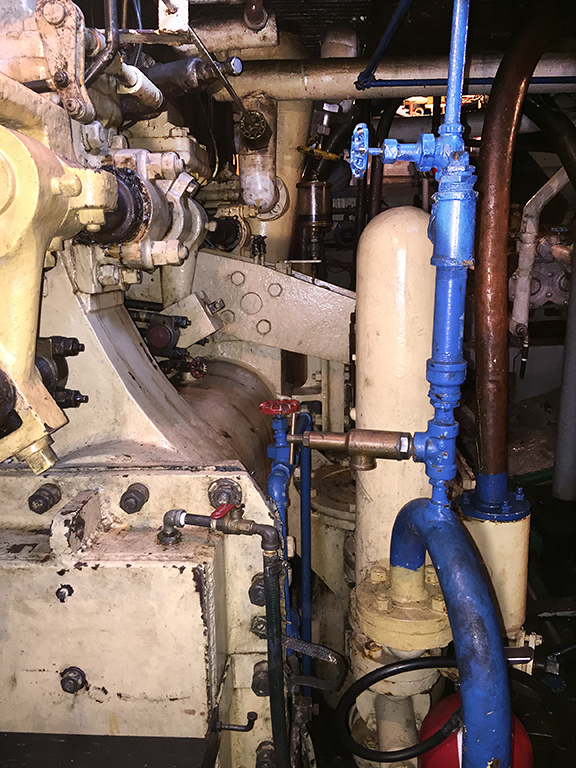 The boiler produces steam and each system is fed via a series of high pressure steam tubes, valves and return tubes. The engine is powered by the main high pressure steam tube and all other ship’s steam systems run form the auxiliary steam tubes. 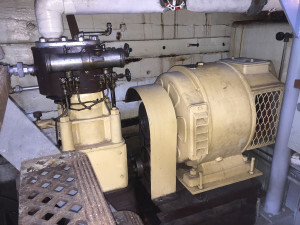 (left) For example, steam from the boiler is sent to the generator’s steam engine which turns the generator. 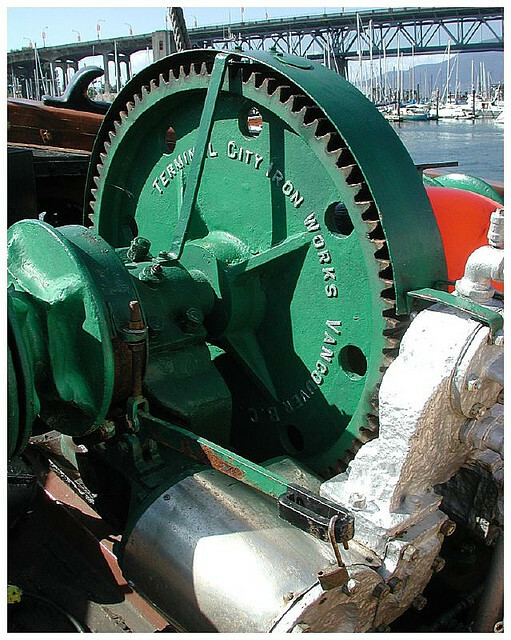 Valves may be opened or closed based on demand for power. 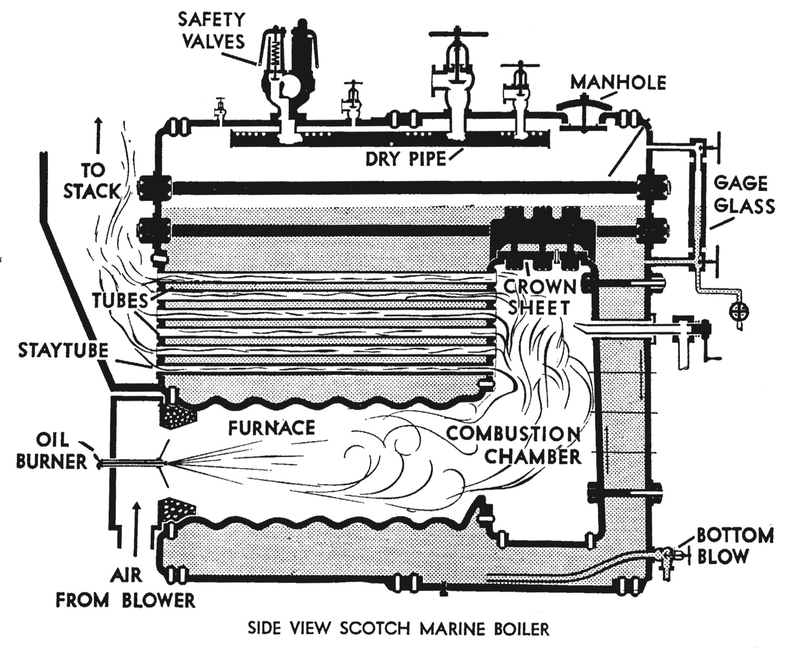 The diagram below is of a typical Scotch Boiler, similar to the one fitted in the Master. Fuel for the boiler, bunker oil or diesel, is carried in a 6,300 gallon tank forward under the main deck. The original tank was 10,000 gallons however, the top 2 feet had to be removed because of corrosion, reducing it’s capacity. She used to steam about 2,000 miles with a full tank, but now with the top 2′ removed, the steaming range has been somewhat reduced. When raising steam from cold, it takes two days, as the boiler has to be “warmed through” slowly to prevent stressing the fire tubes etc. 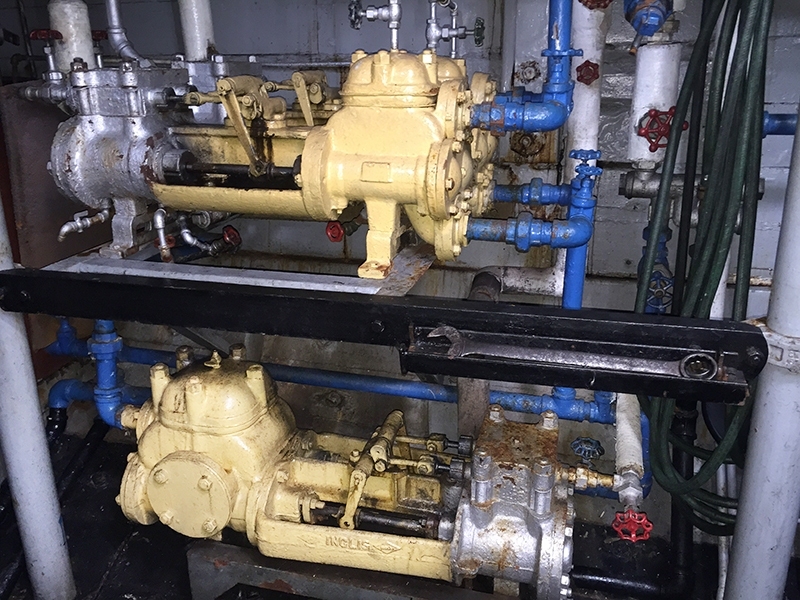 There are two main types of marine boilers, Scotch Boilers and Watertube Boilers. Both have advantages and disadvantages. The Scotch boiler has a larger water capacity and stores a greater amount of heat energy resulting in steadier steaming pressure. They are cheaper to build and tolerate dirtier water, even sea water if necessary. The design of the Scotch boiler generally requires less repair. 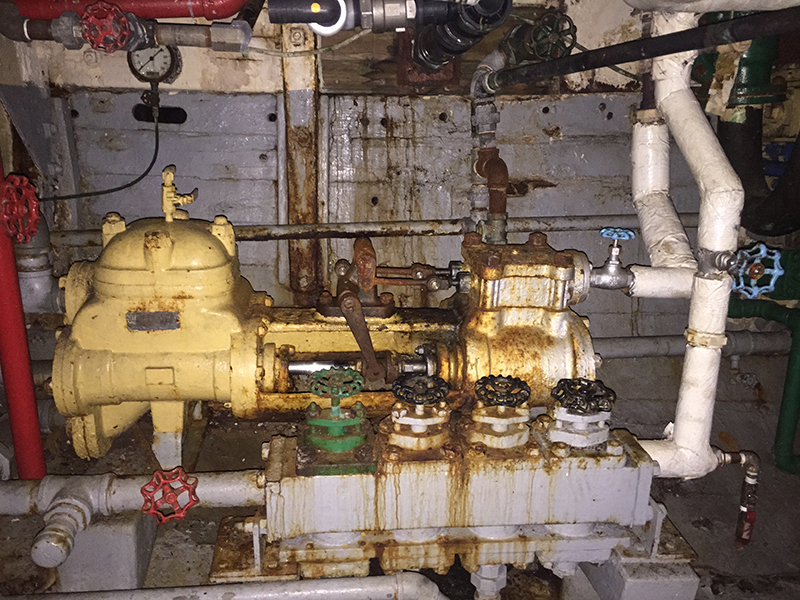 Scotch boilers are much larger, taking up greater space below deck. Because of their large size, raising steam takes much longer. The stored up energy in one large container makes for a greater possibility of explosion. 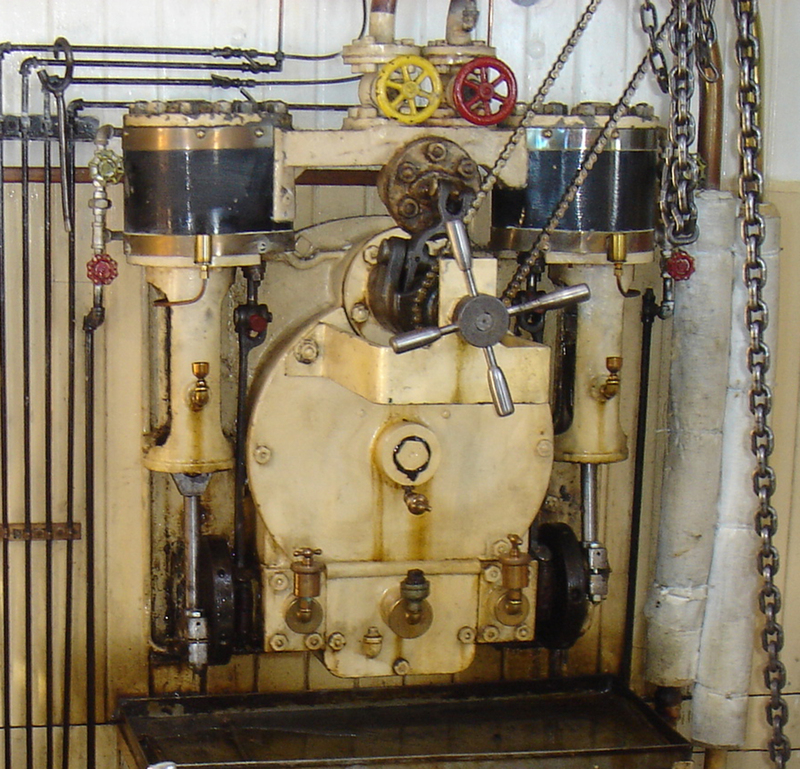 Operating pressure for a Scotch boiler cannot be greater than about 250 pounds per square inch. 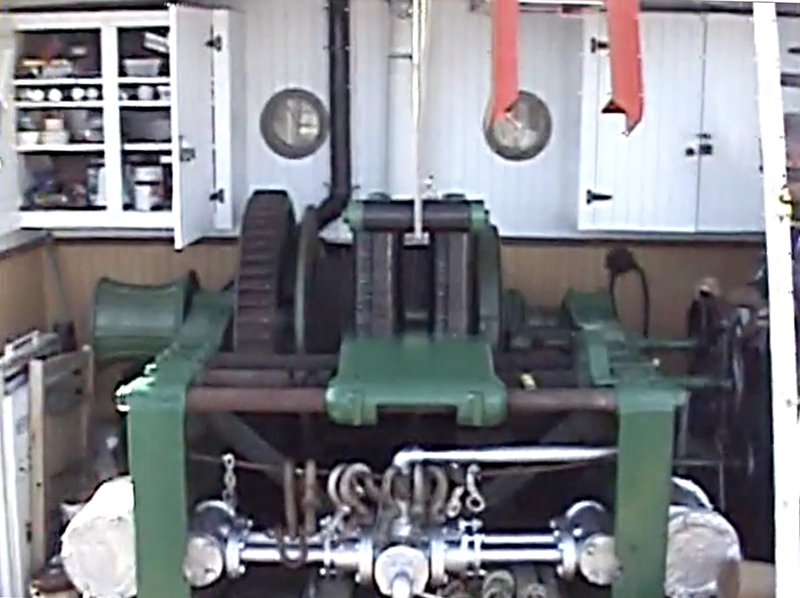 Scotch boilers are generally not as efficient as Watertube boilers.